One of the best things since creating my blog is making connections with people all around the world. One of my biggest supporters and favorite blogs to get inspiration from is Tara Leydon’s The TL Blog. 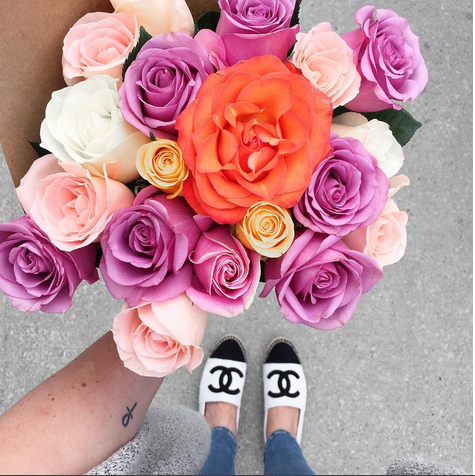 Tara's instragram, @Taraleydon is one of the most gorgeous feeds of flowers, make up and hotpots to visit. I am so excited to share a fellow rock star in rockstuds. When did you start the TL Blog? I started the TL blog in Oct of 2015 my first official post was about my recent trip to NYC! What are some of your favorite beauty products/brands you can’t live without? Where are some of your favorite places to go in Toronto? What cities are on your dream travel list? I've been lucky enough to do a large amount of traveling but some new places I have on my list would be Tokyo, Beijing, Shanghai, Cape Town in South Africa, Barcelona and I'd love to go Thai Island hopping because when I went to Thailand I traveled around other parts of the country and didn't get to the islands. What are some useful tips when it comes to creating the most perfect insta worthy photo? I would say as much as you can try to take photos in good natural light, natural lighting is so key! There are tons of photo apps out there, try them out and see what your faves are. I love Afterlight and Lightroom. Also take photos of things you love not things you think would make a good insta, stay true to the things YOU love and want to share with others.